I promised my friend Laura on Instagram that I would do this post and I really think it is a great idea for all of my Canadian readers! I'm a member of plenty of points programs, but none of them reward me as well as the Shoppers Optimum one. I do think that there is a bit of a learning curve and finding what works best for you, but it's amazing once you get the hang of it. I don't consider myself a pro at all, but I do manage to get $200+ of goods each year with my points. Granted, it could be more if I shopped there more frequently but this is what works with my existing budget. If you do a lot of your shopping there, maybe you aren't taking full advantage of the program. Or maybe you shop there very little and don't think you can utilize the points enough to make a difference. I'm telling you that you can! You can earn and redeem Optimum Points at Shoppers Drug Mart, Murale, and Pharmaprix. You earn a minimum of 10 points for every dollar spent and you aim to reach point tiers. The tiers are: 8,000 Points ($10), 22,000 ($30), 38,000 ($60), 50,000 ($85), and 95,000 ($170). You can redeem those points toward most purchases. And you can earn points on most purchases in store, as well as online orders on their Beauty Boutique. Now here are a few of my personal tips and how I make the program work for me! 1. 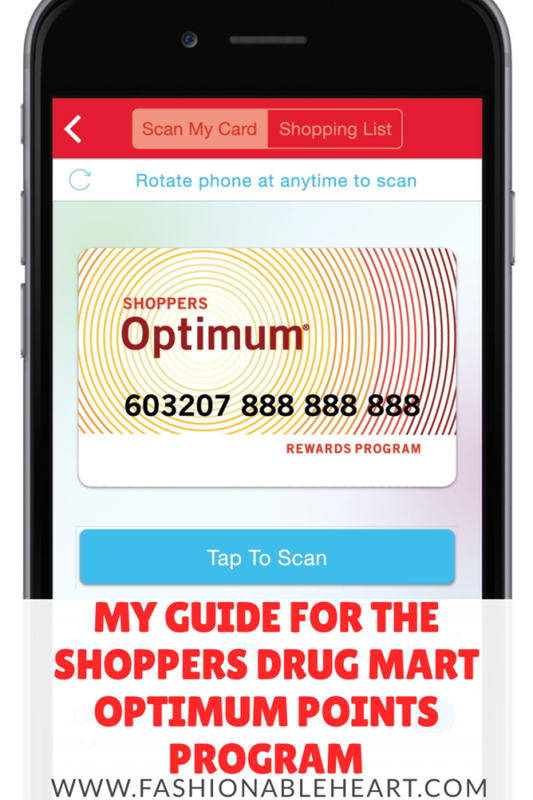 Download the Shoppers Drug Mart app. It gives you personal offers each week to load to your card. For instance, milk is the same price there as all of my local grocery stores so I buy it at Shoppers and I get 10-20x the points most weeks. The sales flyer is also built into the app. 2. Look at the sales flyer and shop around the sales. I am on a budget and I try not to buy just to buy something. This is where I make the program work to my own needs. Look at what is on sale and what you need and sometimes there will be bonus offers to load for some of them. Like I bought a Revlon nail polish last time that was on sale for $3.99 and 1500 bonus points. Double win! 3. Wait to make bigger purchases during the sales events that offer 20x the points on a purchase of a certain amount. It's usually 20x your points total on a purchase of $50 or more. And if you're into instant gratification, they also have deals like that with gift cards and movie passes instead of bonus points. So you might see offers for two admit one movie passes with a purchase of $75 or more. They have different offers similar to those all of the time. 4. I try not to use the points too much while I'm on a lower points tier and let them collect to the higher levels. A few times a year, Shoppers brings around a "Spend Your Points" event. They vary by offering either letting you get more with your points or offering bonus points right back into your account. So doing the 95,000 level might get you $200 off instead of $170 or you get the $170 off and they give you back 22,000 bonus points ($30) to your account after a few days. They even each other out, so it's just personal preference. I just did this recently and spent 95,000 points and my 22,000 bonus points should be back in my account shortly. I recommend taking advantage of these events to really make your points go further. 5. Don't go in there and buy everything just to get points. I promise they'll add up just by you getting the things you really need/want or those that are on sale. Don't spend more on an item at Shoppers that you can get for less elsewhere just for points. That mind frame hurts more than it helps. This can take a little homework about becoming familiar with what you pay at other stores and comparing store flyers each week that you shop, which is something that I highly recommend doing. Sometimes they have sale items and limit how many you can buy. If you see a good deal that is better than elsewhere, stock up. Even better if that good deal falls within one of the points events. If you use the app and load your offers and take advantage of the points events and offers, the points will add up quickly. If I didn't explain something well or didn't answer a specific question you have, let me know in the comments. I do hope this helps!